Facebook Inc.’s (FB) stock has gone from a Wall Street hero to zero in a matter of months. The stock has tumbled 39% since peaking in July around the price of $220 per share. Now the stock trades around a price of $132 and could be heading even lower. The stock was added to the WhaleWisdom WhaleIndex on May 18, 2015 and has increased 63%, easily beating the S&P 500’s rise of 24%. Despite the strong long-term performance, sentiment has changed quickly. Hedge funds and institutions were dumping the stock in the third quarter at an aggressive pace. That is because many investors were blindsided when the company said on its second quarter conference call that costs to protect user data were on the rise. During the third quarter, the number of total 13F shares held by hedge funds fell 21% to 131 million shares. 65 hedge funds exited the stock during the quarter, while 115 reduced their stakes. The number of funds creating new positions were 31 while 117 added to existing positions. The total number of 13F shares held by total institutions fell 4% to 1.68 billion shares. The stock started falling in July after the company said it would see higher than expected costs and lower margins in the future. The company was planning to spend a significant amount to provide more surveillance of its users following the fallout from the Cambridge Analytica scandal and issues around user data privacy. As a result, analysts have been cutting their earnings and revenue estimates for the company’s fourth quarter. Earnings are now forecasted to fall 2% versus prior estimates for growth of 10% in July. Revenue estimates have fallen as well and are now seen rising 26% from prior estimates of 34%. Full-year earnings and revenue estimates have dropped. 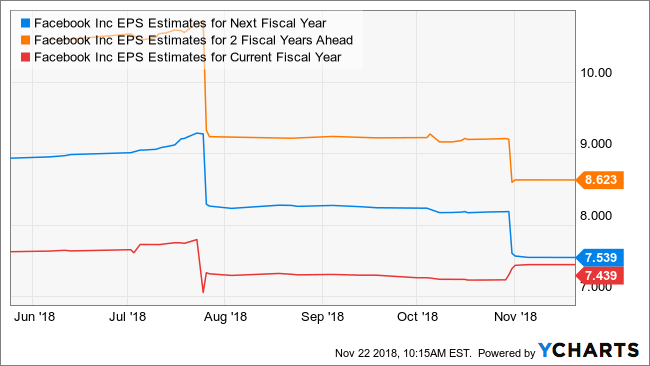 But more problematic is that earnings estimates for 2019 have fallen 17% to $7.54 per share, down from prior estimates of $9.04 and a steep decline. The estimates for 2020 have fallen 18.5% to $8.62 per share. An investor can now even argue that the stock is expensive trading at a 2019 PE ratio of nearly 18. 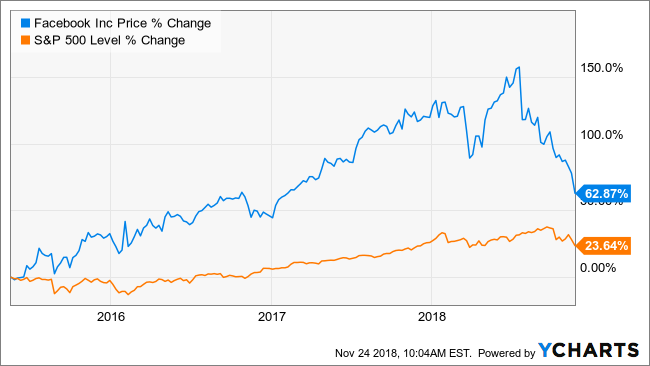 That is because the stock is expected to average earnings growth of 8% over the next two years, and the PE ratio is more than double that growth rate, with a PEG ratio of 2.3. 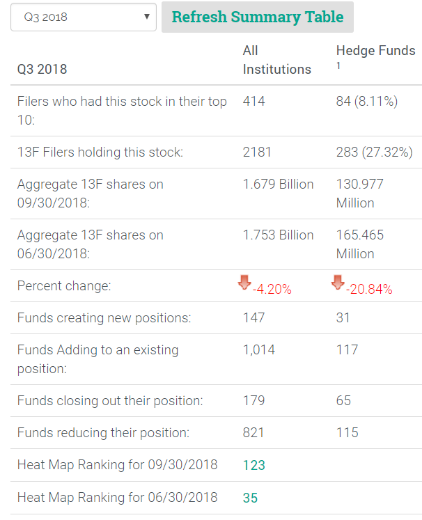 The stock has fallen 18% since the end of the third quarter, and it would suggest that the hedge fund and institutions that were selling in the third quarter are far from finished. Should earnings and revenue estimates continue to fall, the stock is likely to fall along with them as investors continue to bail. This entry was posted on Monday, November 26th, 2018 at 10:18 am and is filed under 13F, WhaleIndex. You can follow any responses to this entry through the RSS 2.0 feed. Both comments and pings are currently closed.